Emerging as a powerhouse live band rooted in Las Vegas over the past few years, Szabo’s (www.szaboband.com) high-octane raw indie sound is emerging at a time when ‘90s rock resurgence is on an upswing, regaining an important foothold in the alternative music market. Led by charismatic frontman Elliot Szabo, their songs are driven by a fiery mix of distorted guitars reminiscent of ‘90s alt-rock and keyboard and electronic textures synonymous with classic new wave. Last year, Entertainment Weekly made note of ‘90s pop/rockers who were hitting the pop charts in 2012: Fiona Apple, Garbage, Soul Asylum, No Doubt, the Offspring, Everclear, Alanis Morissette, Melissa Etheridge and Matchbox Twenty. Perhaps it’s just cyclical or generational, but mostly they’re still out there rocking because their sound, like decade itself, never stopped being cool. 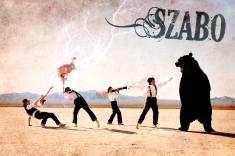 Szabo—whose founding core includes Elliot, bassist Gary Coveney and drummer Austin Perry—recorded and mixed their highly anticipated debut EP Get Wasted, available Summer 2013 on their website for a download price of your choosing, at Battle Born Studios, owned by Vegas-based superstars The Killers. Their good timing also extends to the new opportunities for performing and touring in support of the forthcoming EP with their first ever L.A. show slated for April 11 at the legendary Roxy Theatre on Sunset Boulevard. After surviving a slew of management changes, the latest one led to the end of the group’s longtime residency at Aliante Casino in North Las Vegas. Evolving through several lineup changes these past few years, Szabo—whose current lineup includes keyboardist Andy Vieluf—has also performed in such prestige spots as the Hard Rock Café on the Vegas Strip and opened for alt-rockers Hoobastank at The Rio. The concept of Szabo the band grew out of the evolving chemistry shared by the supporting musicians who accompanied Elliot as he performed local shows and toured throughout California in support of his 2009 solo EP Between Two Points on a Map—a collection Elliot calls his “super lonely, depressed singer/songwriter EP. The creative seeds of the Get Wasted EP were planted months before when Elliot took up a wild challenge to enter songs in a contest sponsored by an indie magazine. Over the course of two weeks as the contest specified, he, Gary and Austin holed up in their studio and wrote 12 songs in only two weeks. One of those tunes, “Minnesota,” was a story song about a hipster chick that (ed) eases from a bossa nova beginning into a high-octane rock chorus. It fit the vibe of the new EP perfectly. Elliot and Gary’s disenchantment with the lack of quality, low cost rehearsal space in Vegas inspired the launch several years ago of their multi-faceted company Griffin Entertainment. Originally specializing in rehearsal facilities in the Downtown area, Griffin soon expanded to include recording and mixing (mostly for demos and small projects), event design and production, AV and lighting, audio recording and video production. They do stage and lighting for special events, corporate meetings, trade shows and conventions. To describe Elliot’s unexpected, often bizarre journey to being the front man of emerging indie rockers and owning a successful studio and events company, it might be too easy to reach for flying metaphors. After leaving his studies at Purdue after a year, the singer/songwriter worked at a transmission parts factory for a few months before hightailing it to Chicago, where he was based as a flight attendant for ATA for five years. Once he got to Vegas, Elliot considered investing the $4,000 he had into flight lessons, but he opted to use it for recording instead. During his time on the ground in Chicago, he formed and was lead singer of Khaos Theory, a Godsmack-esque group mostly comprised of older guys. They played numerous clubs and were a popular attraction at biker bars. When the airline folded, Elliot moved with his wife to her parents’ town of Lafayette, Indiana to regroup. While doing open mic nights with his acoustic songs, he had a series of funky day jobs, from working in corporate for a hospital and selling copiers to valuing claims for an insurance company. During this time, he honed his chops doing small tours as a solo acoustic artist—playing gigs in Chicago, Lafayette, Louisville, Indianapolis, Champaign and other cities. While Vegas is a challenging place for indie bands to make their mark, Elliot is grateful that his wife was transferred there because meeting the musicians who ultimately became core players in Szabo proved to be a life changing experience musically and otherwise. They helped him realize that there was more to his artistry than being a solo acoustic artist—and now he can’t imagine things working out any other way.